Réalisée en 1959, cette oeuvre porte le numéro cent quatre-vingt quatre d'une édition P.R.P.M. de cinq cents exemplaires. 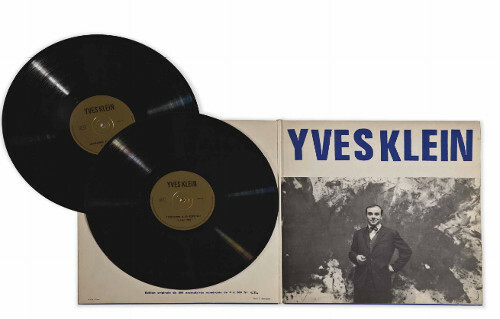 'CONFÉRENCE À LA SORBONNE, 3 JUIN 1959'; NUMBERED WITH FELT PEN; VINYL RECORD AND SLEEVE. Edition limitee numero 448/500 no label but marked R.P.M. Paris in tiny print on the inner of the beautiful blue gatefold. Spoken word pressure direct from the sweat lodge of the Sorbonne June '59. The anthropologists who recorded this go uncredited but no doubt they will have canoed up the Boulevard St. Michel and negotiated a perilous passage through the hallowed halls using a rigourous dialectical smokescreen and the odd bone thrown to the rude waiters. Klein is pumped up and telling it to his tribe. They are voracious and devour everything he dishes into his conceptual cauldron. Sadly the xylophone orchestra and the nose flute guy flaked and never showed up. The recording suffers but this is still an essential purchase for those needing up a level in monochromatics and folks desiring a psychic passport to the contemplative state experienced in "Le Monde Du Bleu". On a clear night in March at ten pm sharp a crowd of one hundred people, all dressed in black tie attire, came to the Galerie International d'Art Contemporain in Paris. The event was the first conceptual piece to be shown at this gallery by their new artist Mr. Yves Klein. The gallery was one of the finest in Paris. Three models appeared, all with very beautiful naked bodies. They were then conducted as was the full orchestra by Mr. Klein. The music began. The models then rolled themselves in the blue paint that had been placed on giant pieces of artist paper - the paper had been carefully placed on one side of the galleries' wall and floor area - opposite the full orchestra. Everything was composed so breathtakingly beautifully. The spectacle was surely a metaphysical and spiritual event for all. This went on for twenty minutes. When the symphony stopped it was followed by a strict twenty minutes of silence, in which everyone in the room willingly froze themselves in their own private meditation space. At the end of Yves' piece everyone in the audience was fully aware they had been in the presence of a genius at work, the piece was a huge success! Mr. Klein triumphed. It would be his greatest moment in art history, a total success. The spectacle had unquestionable poetic beauty, and Mr. Kleins' last words that night were, "THE MYTH IS IN ART". In March 1960, at the Galerie Internationale d'Art Contemporain, Paris, Yves Klein presented his Monotone Symphony and Anthropometries of the Blue Period. Klein conducted a ten-piece orchestra in his personal composition the Monotone Symphony, a work he had written in 1949. This symphony consisted of a single tone. As the orchestra played his composition, three beautiful naked models rolled themselves in blue paint and then pressed their bodies onto giant pieces of paper to create paintings. On March the 1st, 2010, to celebrate the 50th anniversary of this major event in contemporary art, video and sound artists Quadratura presented a new performance at the GV Art Gallery in London. On this occasion Martin A. Smith played his reworking of the Monotone Symphony and Alex May re-created The Anthropometries of the Blue Period images using their bespoke interactive video projection software. Light was projected at a plain white wall and as the performers stood still their silhouettes slowly filled in with colour. When the performers moved the colours merged into one another to create a changing and evolving image.